Brand promotion through email marketing is a crucial tool for customer acquisition and engagement. Many businesses waste precious effort and resources because they don’t plan their brand promotion properly. Traditionally, retailers have been able to just post huge signs and distribute flyers making consumers aware of the sale in the back. Their storefronts could remain nicely decorated. Ecommerce retailers face a new challenge. They promote multiple product categories, various CTAs, and a sense of urgency practically daily to customers. While it may be efficient in the short-term, it dilutes the value of the brand. Consumers aren’t curious to see new advertisements or flyer graphics, but they might be curious about new products and discounts. Promotion is pushing a category. That’s it. It doesn’t necessarily have to be about marking down price, although that’s definitely part of it. So, how exactly do you push a category while maintaining the integrity of your brand? An email that simply says “30% off” in large font will not be the greatest promotion. Instead of focusing on the promotion, shine the spotlight on your product. 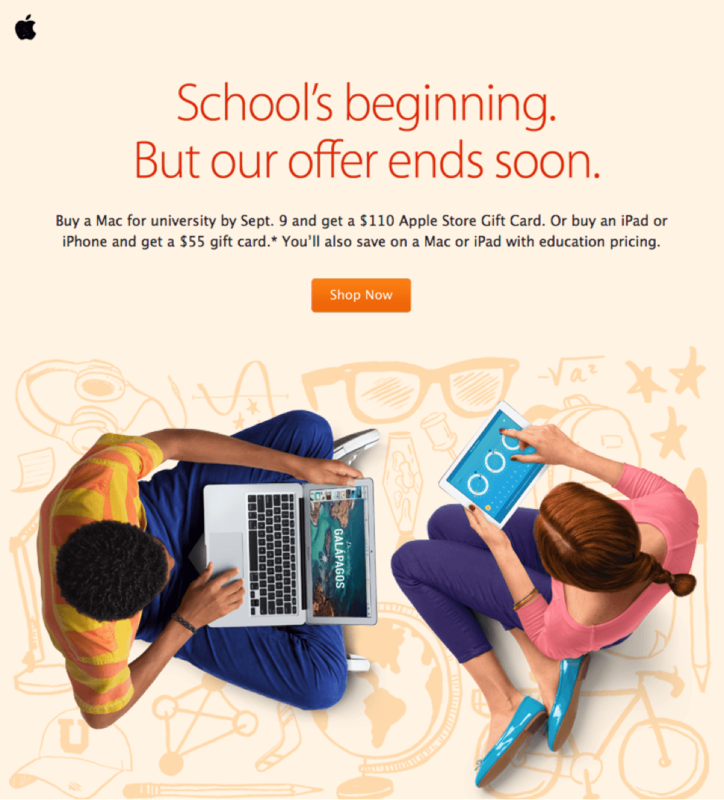 Apple doesn’t mention the discount at all in the headline. There’s no “30% off!” They mention the season – school time. They state that they have an offer. Then, in the subsequent text, they go into specifics. The largest portion of real estate is saved for their graphic, which features two students using their Apple products. The product is the hero. Now, let’s look at a more standard brand. 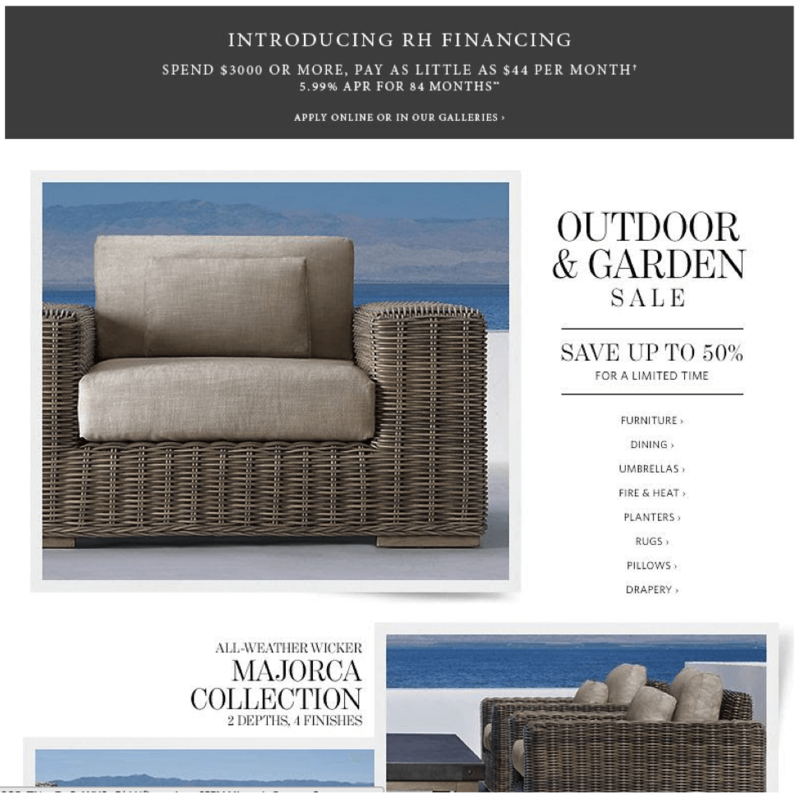 There isn’t any loud discount in the headline “Outdoor & Garden Sale.” However, there is an aggressive “Save up to 50%” promotion in the subtitle. The majority of the screen real estate is dedicated to photos of their products. The product, once again, is the hero. Once brands start making their product the hero, the next challenge is to time promotional emails so that they connect with the audience. Unfortunately, many brands rush out emails without a strategy. Avoid this by creating a promotional cadence that’s scheduled to fit in with seasonal and event changes. Most companies have an idea of the inventory they won’t be able to sell. They also have set up and understand their markdown and promotional cadences. With this information available to them, it’s a mystery why so many of them execute so badly. 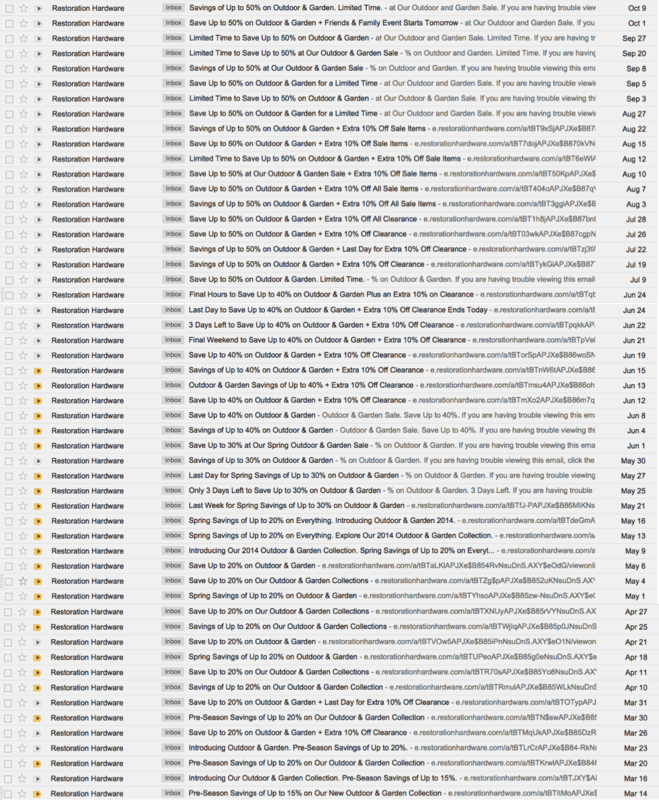 Most email marketing is either obvious and repetitive or sloppy and rushed. Both turn customers off. So, whether you’re discounting 5 percent or 50 percent, you should plan your promotional cadence with some flexibility. Instead of blitzing through all your inventory within a week, create a campaign where you make customers aware of the product. For example, if you were to plan a five week campaign, Phase 1 could be a promotion at full price. Phase 2 could feature a markdown (usually only a slight markdown). Phase 3 might feature a bit more of an emphasis on the discount. The Phase 4 email could focus on the sale. And, Phase 5 could feature an even more aggressive sale. It’s not necessary to commit to specific percentages in these promotions. Instead, make it a priority to communicate your concept and cadence. In a best case scenario, you will sell out of inventory more quickly than expected and have fewer promotional emails. In order to make everything operationally cohesive, understand different teams’ schedules. Remember, these are symbiotic relationships. In many cases, it’s about connecting at least the marketing and design teams together. Since departments don’t speak to each other effectively, marketing ends up acting separately from design. Both of them end up acting separately from product. There should be greater connectivity, understanding, and education as to how these frequently-siloed teams affect each other. The marketing lead or branding director in your business can’t be talking to everyone all the time about everything. One solution for getting everyone on the same page is brand guidelines, which enable a consistent, sequential, and replicable approach for creating assets. Brand guidelines can be created to get every team member, freelancer, and contractor on the same page. The guidelines can inform them of appropriate voice and tone, specifications for visuals, and seasonal standards for outreach. Generally, the creative lead is the one who introduces brand guidelines into the company. While these core components are crucial, your brand guidelines might expand to cover design or copywriting more specifically. You’ll find that the brand guidelines for Apple, Groupon, and Skype are equally interesting. Each has its own realm of focus. Learn from the best. It’s easy to dilute your brand when you’re promoting, but great brands and entrepreneurs master the art of promotion. Make your product the hero. Plan your promotion cadences appropriately. Establish brand guidelines to get everyone on the same page. Rather than make the brand part of a promotion, make the promotion part of the brand. You’ll turn your promotions into opportunities to develop your brand even further.